With an alarming percentage of Americans living paycheck-to-paycheck, it is no surprise that the average American home has over $90,000 in consumer debt, totaling to over $3 trillion nationwide (source). Wow. This debt includes credit cards, car loans, and student loans. so it doesn't even count mortgages. Here's the correlation between these reports: Since most Americans are living paycheck-to-paycheck, they cannot afford ANY unplanned expenses in their routine. This means that when an emergency arises (and let's be honest, they happen), most Americans cannot afford them. Emergencies are by definition unplanned mandatory spending. And when you can't afford it, you must go into debt to pay for it. That's why living paycheck-to-paycheck easily leads to debt… even though you make enough money to pay your bills. 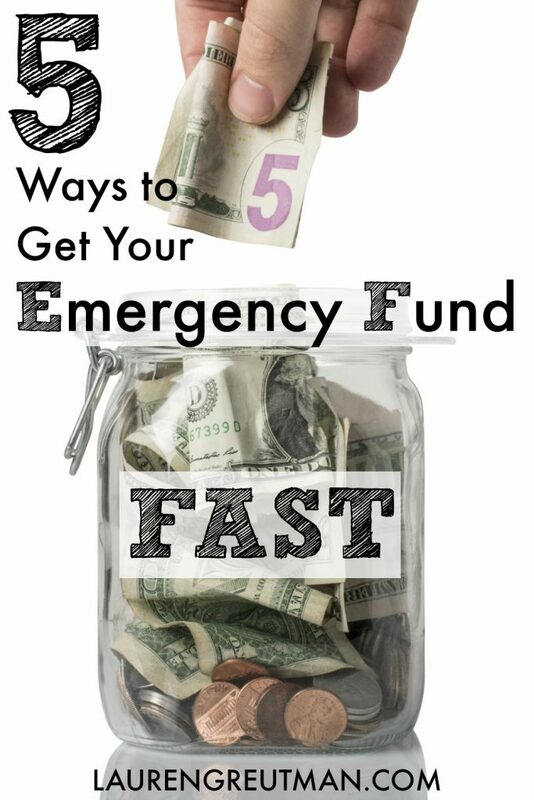 To break out of this cycle, you HAVE TO set up an emergency fund! You need to have money set aside that is ONLY for emergencies. I remember after Mark and I got our Emergency Fund set up, we had some unexpected car repairs. We were able to get it fixed with CASH! It was the first time we did not have to lean on our credit cards in an emergency. It was so empowering! Without getting a second job! Most of you have heard me talk about selling stuff online before. It is such an easy way to help you set up an emergency fund and declutter your house at once. That makes it one of those true win-wins in life. Here are a few rules we use to help keep our house decluttered and I have used to make us hundreds of dollars on the side. Some items sell better on eBay, and some sell better on Craigslist or maybe a local Facebook yard sale group. If you haven't used it in over a year, sell it. If it is the wrong size (and in good condition), sell it. If it isn't clothing you LOVE, you probably won't wear it, so sell it. I give a GREAT strategy for this during Part 2 of my 3-Part ‘Spendervention' Documentary. There are SO many online banks today that will offer you a bonus just by switching! And you don't have to deposit your whole paycheck in there. You can keep most of your paycheck with your current bank, and then use the new bank account to place your emergency fund money in. These bonuses range from $100 – $200 just for switching. Just make sure to use a bank with no monthly fees. The online-only Chime Bank has a “keep the change” type program where they'll give you a weekly rewards bonus equal to 10% of your “keep the change” savings – up to $500 a year. So, you can earn $500 in free money every year for your emergency fund just by using their Spending and savings account. This one might not be as easy for some of you, but give it a shot! Take every penny you would have spent eating out for one month and put it right in an emergency fund. For many of you, that's going to be a surprising amount of money… and then you have to solve your dinner problem. In the immediate, this is inconvenient, but hey, emergencies are WAY more inconvenient. But there are those nights where everyone gets home at 6 or 7 pm, and there are no plans for dinner. Try stopping at the grocery store and grabbing some chicken or beef that's on sale, a cheap bag of frozen veggies, and some rice. Do a quick internet search for a recipe you like and give it a shot. You'll have to wait an extra 30-45 mins for dinner, but you have saved a bunch of money in the process. An even easier option is to give one of our meal plans a shot! The entire reason I developed them was to cheaply and effectively destroy the “what's for dinner” panic. To take a few hours on a Sunday and prepare 20 crock pot freezer meals for around $150 is going to save you time, money, and stress. This goes along with #3 a little. Something else worth considering to create your emergency fund is your Date-Night. It is so easy to spend $50-$100 or more on a date night with my hubby if we are not careful. Plus a babysitter! What if for a month or two, you go on a dessert date, or go on a romantic walk, or something else creative? Just eat at home beforehand. There are plenty of ways to get amazing quality time with your love without spending at restaurants. Remember the goal is to sacrifice a little now to make your emergencies more manageable later. When you can't cover an emergency with cash, some things need to go, even if it's just temporarily. If you have both cable and internet streaming services you're paying for – pick one and cancel the other. If you have both a home phone and cell phones – pick one to keep and one to cancel. The point is, that you may not be able to afford the luxury of ‘both-and' in the TV and phone departments right now. So, pick one of them (either-or), cancel the other, and put the monthly savings towards your Emergency Fund. Once you're Emergency Fund is fully funded, then you can consider picking up service again, but honestly, you might enjoy the financial breathing room a little more.